Some days, you just need a little inspiration… you know, those I’m-so-bored-there’s-nothing-to-do days. This is where you break out the imagination! 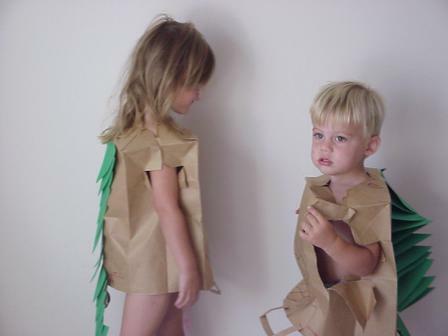 I took out one paper bag for each child and asked them what they wanted to be. On this particular day, it was “Dragons!” — ok. I can do this. First, I cut out a circle for their heads to poke through on the bottom of the bags, and arm holes on the sides. Then I cut up a bunch of green paper triangles and had M&B help me glue them on to the “back” of our costume. Lastly, I had them personalize the fronts with colorful magic markers.